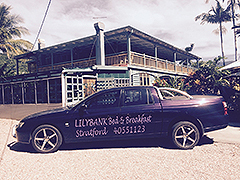 Cairns bed and breakfast accommodation doesn’t get any better than Lilybank. Situated in the leafy suburb of Stratford, this 6-bedroom, 2-storey historic house offers privacy, comfort, convenience and the chance to live like a local. Set in a stately, timber, Queenslander-style property, Lilybank Bed and Breakfast has provided a tropical sanctuary to its residents in one form or another for nearly 100 years. Retaining the charm of yesterday with original lead lighting and casement windows, the property was refurbished and furnished in October 2013 to provide the best of modern comfort, including all new beds, linen, air-conditioning, WIFI and a resort-style swimming pool. Set on 1400m2 of landscaped tropical gardens, which feature a collection of fruit trees, native plantings and architectural plants, Lilybank is 10-minute drive from Cairns city and a 700m walk from Stratford Village. Stratford is the perfect base to explore Cairns and Far North Queensland. Nestled between the mighty Barron River and rainforest covered Mount Whitfield, Stratford is central to Cairns city, airport and northern beaches. It’s also in close proximity to some of the region’s top attractions, including the Cairns Botanic Gardens, Kuranda Scenic Railway, Skyrail Rainforest Cableway and Tanks Arts Centre. Day tours to the Great Barrier Reef depart Cairns daily and most tour companies offer complimentary transfers to and from Lilybank. Note: We can help with tour bookings at Lilybank. Lilybank is an iconic landmark feature of this popular suburb and is even featured on the Stratford Heritage Trail. Built in the early 1900s, this historic house was designed for topical living and features wide shaded verandahs which wrap around the spacious bedrooms, open plan communal spaces and polished timber floors. The rooms are spacious and comfortable, featuring brand new beds with 400 thread count linen sheets and hypoallergenic pillows. All of the rooms have private ensuites, bar fridges, brand new carpeting, air-conditioning, fans and storage space. For your convenience, there are no minimum night stays at Lilybank Bed and Breakfast. Check-in is usually from 12pm with check-out at 11am sharp, however, early check-in and late check-out can be arranged at no extra charge. We will also look after luggage while you are on tour and/or catching a late flight out. Lilybank owners, Linda and Scott Ashworth have lived in Stratford for 18 years. They love the region and are passionate about providing you with a home away from home, so you can live like a local on your visit to Cairns and Far North Queensland.